Share the story of a time you felt unsafe. The most memorable time that I felt unsafe and insecure was a time when we were in the middle of the ocean, aboard a relatively small ship. We had experienced some quite strong winds, and there was a rough swell, that was rocking the ship a little. We were quite used to this traversing the Bay of Biscay. On that memorable day we were eating a leisurely meal in the ship’s dining-room, I was sitting opposite my wife Margaret, with a view of the open sea through the windows on the side of the ship. The dining-room was quite high up, on the fourth level of eight, or nine if you include the open Verandah deck. As I looked up, the windows in front of my viewpoint were underwater, literally underwater! Then within a millisecond or less, there was an huge shocking bang, as an enormous freak wave hit the side of the ship. The shock reverberated through the dining room, tables were thrown over and large metal serving stations were upended. There was the sound of crockery smashing everywhere and food and broken glass was scattered. Several passengers were injured as the tables trapped people beneath them and the room was an area of total devastation. All of the public rooms were affected and the damage to the fixtures and fittings was substantial. The passengers were ordered to return to their cabins as the clear-up began, we returned to find our television set had been ripped from the brackets that secured it to the wall. The maintenance department were obviously attending to the urgent areas of dangerously damaged fixtures and fittings. We were confined to our cabins until further notice, and informed that our meals would be delivered to our cabins by the room-service staff. The Captain kept everyone well informed, of the ongoing situation over the internal tannoy system. The weather was still pretty rough and the seas were high but nothing to compare with the original freak wave that had caused such devastation. That was totally unexpected by the officers on the bridge and came literally out of nowhere. We were confined to our cabins for almost two days, and for us that was the safest place to be. I certainly felt unsafe during those two days of high seas, and I was quite relieved when things were back to normal and our ship was sailing on calm waters into the sunshine. Yes, this looks a good place. A restaurant by the lakeside, in the middle of this beautiful park in the city centre. I will sit here and buy a pot of tea and watch the world go by in the peace and tranquility of a Sunday afternoon. The waitress arrived with a bone china teapot and a single cup and saucer, with a familiar willow pattern blue and white design. 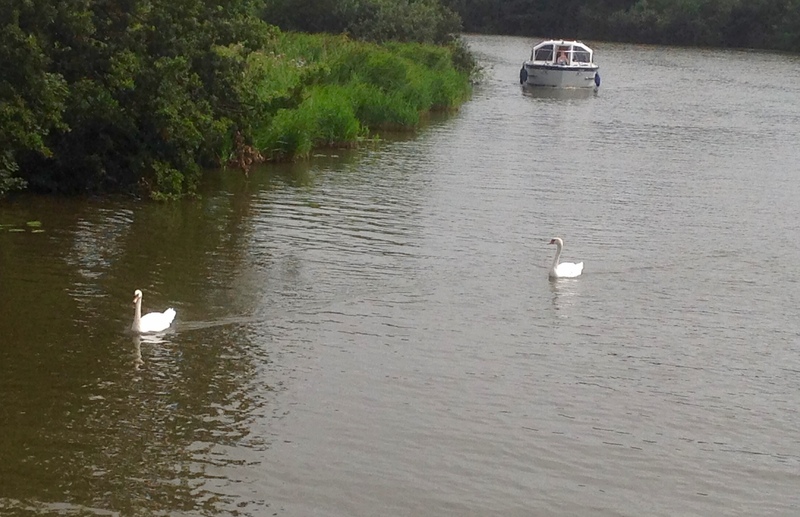 I am entranced with the swans gliding across the water and the beautiful surroundings of the lakeside banks. This unwarranted intrusion into my solitary reverie was made by a voice with a distinctive loud foreign accent. Without waiting for a reply from me, a rather portly gentleman sat directly opposite and signalled to the waitress. I shook my head in sheer disbelief that a total stranger could shatter my peace and suddenly without a formal introduction or any knowledge of me whatsoever, suddenly offer me a job. I was suspicious of his incredibly easy approach and his whole lax demeanour. I had no idea what the outcome of this meeting would be as I nodded my head and agreed to his proposal. Nathan then went on to describe his business and his home state in Canada, and I began to warm to his friendly attitude as he drew me out of my shell. I described myself and my studies at the University and he listened with a friendly interest. The next morning I was very early in the restaurant by the lakeside in the park, sipping my tea and watching the swans floating on the water. “Pleased to meet you.” I gasped, as I recognised the young lady who was strolling behind them, smiling and laughing. I was so stunned and overcome with happiness, I just mumbled one word.